Once again I’ve jumped in to a trilogy without reading part one, but I read the amazon sample and a few reviews, so had a good idea of how the story was working. Whereas last book seemed to focus on Andi and the Tala, this one is centred around Amelia (Ami). Ami seemed a bit..shallow to be honest. Its not really her fault, she’s been brought up with wealth and privilege, and to believe that her beauty is something to be admired, and add on that she’s Glorianna’s Avatar and its not hard to understand why she’s so vacuous at times. The eldest sister Ursula has always been mother to the two younger sisters and a warrior, always strategizing with their father and looking to protect her people. She’s very conscious of duty, and Andi was always the odd middle child, didn’t have Ursula’s intelligence for military matters nor Ami’s beauty, and was left to go her own way. Now she’s on the opposite side to her sisters, married to their enemy and Queen of the Tala. Ami was deeply in love with the handsome Hugh, looking to have a long future with him and their children, being a bountiful avatar and Queen and now its all gone wrong. Hugh is dead, killed in a battle with the Tala, and her father and father in law seek to control her and the child she carries, and she’s grief stricken and finding it hard to decide anything. Even in that at times its as of she’s playing a role it seems to me. then events begin to challenge her, not least the assistant to Kir, Glorianna’s priest. The White Monk pushes at Ami with some harsh words, and she takes a look at her life, not through her eyes of the past but through the eyes upon her, and sees that she’s at the centre of a power struggle. It seems Kir too has a taste for controlling her. Ami is really growing up now, no longer a pampered child and not happy at what she sees of herself, and with the help of some trusted people slowly seeks to change. Its a dangerous path she treads though, not knowing quite who she can trust and learning as she goes the kind of strategies Ursula excels at. The journey isn’t just mental but physical too, trying to see if she can enter Anwynn, the place where Andi and the Tala reside that’s full of magic, and along the way she finds a new and forbidden love. I really enjoyed seeing how she changed from the vapid and shallow child she was – even though married she was still a teen and acted like it, to a sensuous and clever lady. I’m keen to see where the journey goes next. 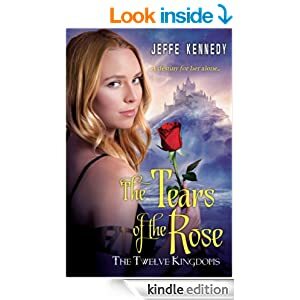 Once again Jeffe has come up with a story that takes a magical slant to it, and I was fascinated by that part – as with Jeffe’s Covenant of Thorns series the magic used here is clever, believable and not some miracle power brought in just at the crucial time. I need that, need to have some kind of grounding reference for it so that I can feel its real, and this book ( and Thorns!) does that. Stars: Four and a half, a great read but not quite as addicting as Covenant of Thorns.